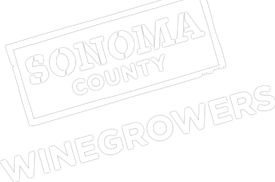 The 2015 winegrape harvest in Sonoma County got off to an early start just after midnight on July 29 when the first grapes of the year – nearly 18 tons of pinot noir – were harvested from Vineyard Eleven off Starr Road in the Russian River Valley. The grapes are contracted to J Vineyards & Winery to be used in the winery’s sparkling wine program. Sparkling wines typically utilize grapes with lower sugar levels which necessitates the early harvest. The 2015 harvest begins as one of the earliest on record in Sonoma County and occurred exactly one day earlier than the 2014 harvest, which began on July 30. Harvest in Sonoma County for still wines such as Chardonnay, Pinot Noir, Sauvignon Blanc and Cabernet Sauvignon is not expected to begin until mid-to-late August and be completed in late October. This is one to two-weeks earlier than normal. Sonoma County Winegrowers is bringing back its popular harvest tracker during this exciting time of year. Consumers can follow the winegrape harvest at www.sonomawinegrape.org/harvest or follow along on Twitter, Facebook, and Instragram with the hashtag #SCHarvest.